Colleges and universities, retail and grocery, food services, hospitality services, oil and gas, municipalities, defense and homeland security, general industry. Pros: Accessibility across the US to home and field based employees. The ability to assign and require completion of training subject at anytime, within a matter of minutes to employees throughout the company. The fact it is continually improving and has since we began utilizing it. Ease of use, yet complex system. Cons: It is a generic program that can be customized to meet most of your wants and needs - there are limitations however in the manner in which I want some functions of the system to operate. With that being said, the Safety Skills staff works with us to make changes and upgrades within reason - we sometimes have to remind ourselves that we are not the only company utilizing this system. We can't expect it to be completely company specific. Overall: We have solved our problems of being able to remotely train over 600 employees, quickly, easily and routinely; and with quality safety courses meeting regulatory compliance. Overall the entire package if effective, professional and the staff at Safety Skills is great to work with and always do their best to address our needs. Pros: SafetySkills worked with us and our current LMS to quickly upload their courses. When the courses have updates, I receive a communication explaining the changes. Our users in the field complete many SafetySkills classes each month and we rarely (if ever) have had any issues with the quality of the content. Overall: The Sales Team and the Customer Service Team are a fantastic group of people. Any time I have reached out with a question, I receive extremely prompt and professional service and support. Their courses meet most of our needs and our users are happy with them. Pros: I love all the different things the software can do. I love all the different ways I can run reports and being able to auto assign reports. Cons: I have to print several certificates a week. I would be very beneficial to be able to print multiple certificates at one time instead of only one at a time. Overall: Overall I love SafetySkills but I believe the reason I've had such a good experience is because the customer support that I have had has been exceptional. Pros: The sales person I dealt with was informative, very knowledgeable and accommodating. Safety Skills had every industry training we needed and more. The system is also to use, very customizable and has its own LMS if you company doesn't have one (we do). Their reporting feature is also very helpful. Cons: They're file sizes tend to be really big, we purchased one course that cannot be condensed any further and is still too big for our LMS to handle. Customer service is really good but they took a while to get back to me a couple times. Overall: Satisfied, they fit the bill and depending on what package you're interested in Saftey Skills is affordable. Cons: Premium price versus other vendors but not too crazy. Overall: Helped create our basic safety training for employees. Training also received Training Unit approval. Customer Service is great when you need something but not pushy when you don't. Enabled us to get our LMS platform up and running in a very short space of time. Pros: Gave is the ability to customize to our needs, easy to use. Provides access to great quality training material. Allows for easy report-running. The administrative support behind the software, CSR has been phenomenal. Cons: The initial set-up was a little confusing, but this just required some more maneuvering around the system to better familiarize myself. 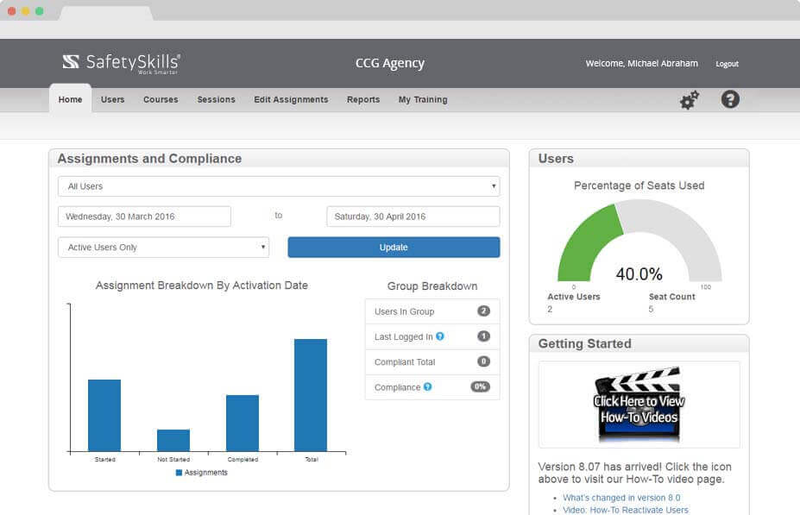 Overall: Easy tracking of training provided across the company, provided flexibility in how we deliver training. First of all, thank you for the kind words. We are proud of our courseware, LMS platform and the level of support we are committed to offering our customers. Secondly, a new onboarding can be challenging mainly because there are so many different ways the platform can be configured to fit different organization needs. We continue to work to make the process simpler and smoother for our new customers. Pros: I was very impressed with the level of content quality for Safety Skills online courses. In addition, their support staff/customer reps are a pleasure to work with. Cons: No drawbacks as far as I can see - while they offer LMS services, without needing, that it's just as easy to plug and play their engaging content on your existing LMS. Overall: I was/am on a committee of testers evaluating future options for content and fully support using SafetySkills - if I were the sole decision maker, they'd be in right now!